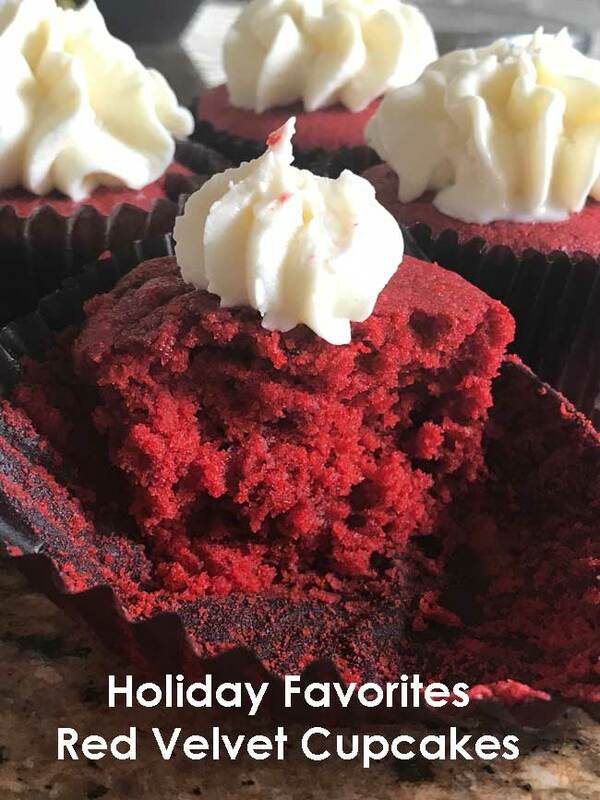 It’s been a while since I posted a recipe for Red Velvet Cupcakes, so here’s one of our new holiday favorites. The recipe is a combination of a few from famous bakeries, and it gives you cupcakes that are a little bit stiffer and sturdier, yet still moist and tender on the inside, thanks to the combination of both buttermilk and sour cream. The recipe doesn’t contain much cocoa, so no one will confuse it with chocolate cake. Personally, I love chocolate cake, but I don’t want too much cocoa in my red velvet. 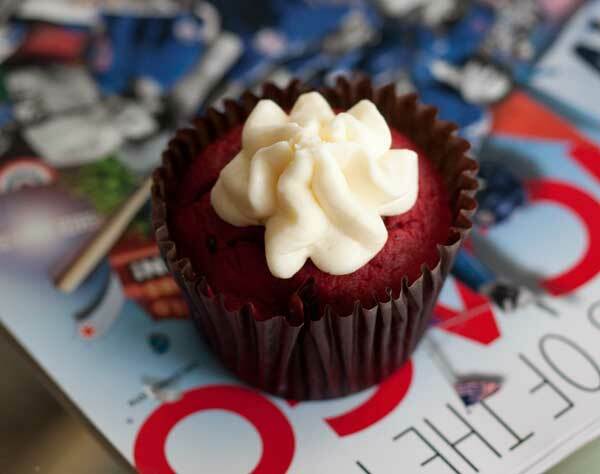 I like the distinct flavor of red velvet, and these cupcakes plus the heavy-on-the-cream-cheese-frosting fills the bill. That being said, if you like a sweeter frosting you can always swap this one out for the usual 8 oz cream cheese, 4 oz butter and 3-4 cups of sugar type. And finally, for the vibrant red color I used Super Red which I bought a few years ago and managed to carry from Austin to Chicago. It comes in a large bottle and since it’s concentrated, you only need about half as much. I got tired of spending $3 on red food coloring every time I wanted to something red velvet, so the Super Red was a good investment. 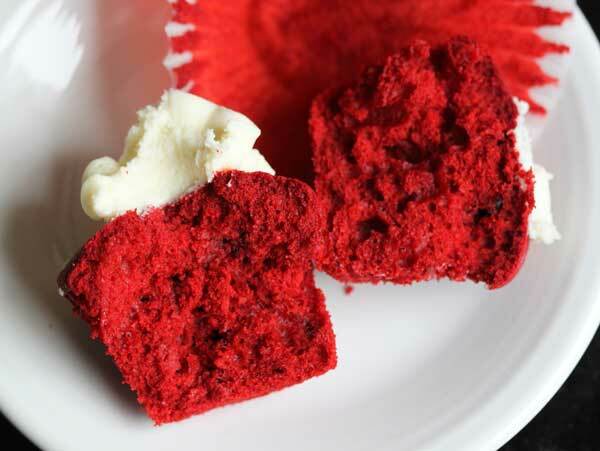 An easy recipe for Red Velvet Cupcakes. These can be made regular size or jumbo. The frosting is not too sweet, but rather very tart with a full cream cheese flavor. Preheat the oven to 350ºF. Line 24 standard muffin cups with paper liners. In a large bowl, whisk together the flours, salt and baking soda. Set aside. In the bowl of a stand mixer fitted with a paddle, beat the butter and sugar until creamy. Reduce to a lower speed and add eggs one at a time, beating well after each egg is added. In a small bowl, stir together cocoa powder, red food coloring, and vanilla, then add to the creamed mixture, scraping bowl often. Stir in the sour cream until it is fully blended, then add the vinegar. Add flour mixture and buttermilk to the batter alternately, using lowest speed of mixer and scraping bowl. Batter will be fairly thick. Spoon batter into cupcake cups and bake on center rack for about 22 minutes or until cakes spring back when touched. Frosting: In the bowl of an stand mixer fitted with a paddle attachment; beat cream cheese and butter on medium to high speed until light and fluffy. Beat in vanilla extract. On a low speed, slowly mix in confectioners' sugar until well combined. Beat until light and creamy. You will get at least 24 cupcakes, but probably more. I get 24 because I use cupcake papers that are slightly taller. They are not the jumbo size liners, but rather liners that fit regular size muffin tins but go up a little higher. I order them on-line. If you want bigger cupcakes and happen to have the 3 1/2 inch jumbo size muffin pans, you'll get 12 cupcakes. Leave me a comment if you try the recipe! I’m curious to hear how it compares with your other holiday favorites.